The system interfaces easily with financial accounting systems as well as with a number of popular CAD/Cam software products. Hardware Requirements: The PERCEPTION system uses the SAP SQL Anywhere database. For a multiuser system, a database server with the minimum requirements can be found here, SAP SQL Anywhere. The clients can be any Microsoft Windows based PC with a minimum of 512MB RAM. Most PCs that are less than 4 years old meet the requirements. PERCEPTION is an Enterprise Resource Planning (ERP) system designed to manage internal and external resources, including tangible assets, financial resources, materials, and human resources. Its purpose is to facilitate the flow of information between all business functions inside the boundaries of the organization and manage the connections to outside stakeholders. Built on a centralized database PERCEPTION consolidates all business operations into a uniform and enterprise-wide system environment. SPAR’s PERCEPTION system combines ERP & EVM to better plan, coordinate and manage the shipyard. 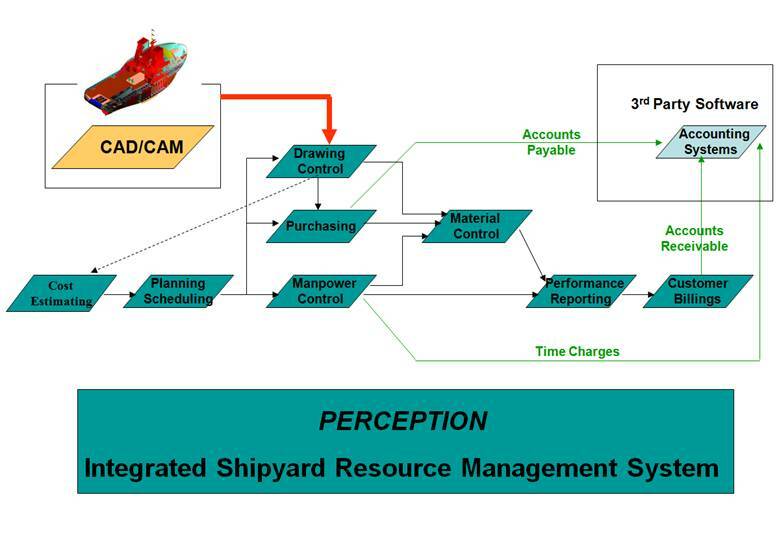 Unlike other ERP and EVM systems, PERCEPTION was designed specifically for shipyards. The building blocks of PERCEPTION's design are based on state-of-the-art client/server technology, flexibility and ease-of-use. This translates to decreased labor costs and increased productivity which yields to raising overall bottom line profits. PERCEPTION is a completely modular software package that is easily customized to specific shipyard requirements. It is capable of integrating all aspects of an operation from inception to completion and provides detailed material status reports, purchasing, plans, work instructions, budgets, cost analysis, schedule performance and more. Through its earned value management reporting, PERCEPTION is a powerful tool for detecting problems in the very early stages of a project. Its built-in alarm system warns as soon as 10% into a project when cost and schedules indicate potential problems. Click here to list and compare PERCEPTION features. PERCEPTION software is designed to move businesses into the 21st century and beyond. It expands as a business grows and allows for the ultimate in comprehensive project management. In today's competitive business climate, PERCEPTION is more than a software solution; it is a key to success. Click here for an overview of the PERCEPTION ERP/EVM system. Click here for PERCEPTION special features for the shipyard. Click here for examples of typical shipyard benefits obtained from PERCEPTION. Click here for comparing PERCEPTION to typical ERP systems. 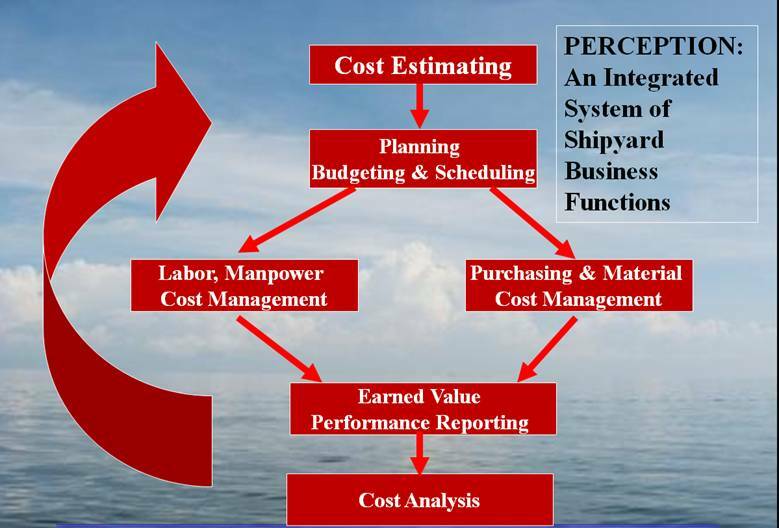 Click here for PERCEPTION addressing the needs for ship repair business. Click here for samples of PERCEPTION Cash Flow Reporting capabilities. The bidding and estimating module. ESTI-MATE is the tool to develop accurate and complete contract cost and pricing proposals. The materials management module. MAT-PAC accommodates the special needs of purchasing contract materials and stock supply. The automated scheduling module. PERT-PAC develops integrated engineering, purchasing and production schedules. The labor and manpower management module. WORK-PAC is the tool to improve management of work performance.